If you don’t see your question here, please use the form in the sidebar and we’ll get back with you immediately. Click on your question to go to the answer. 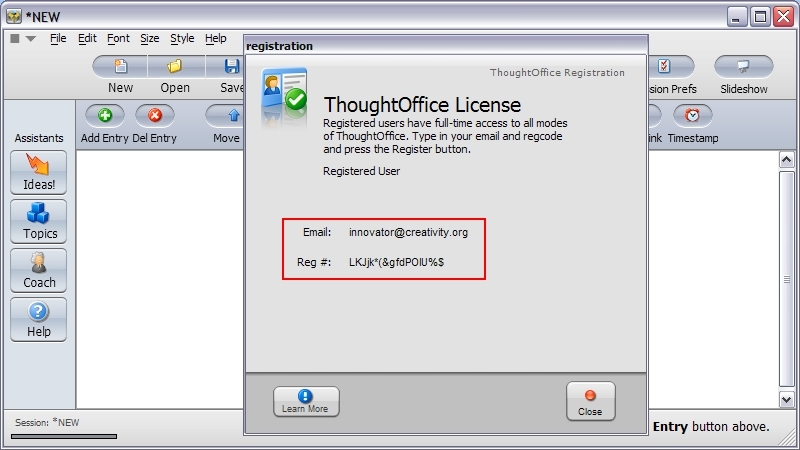 Is ThoughtOffice fully compatible with Mac OS X Lion? What about Windows 7? 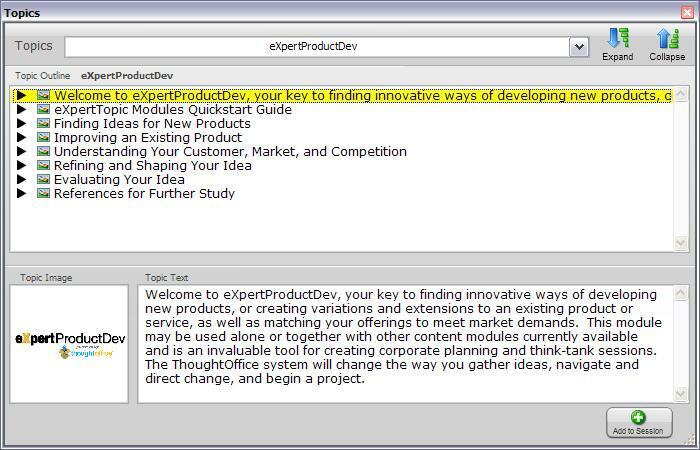 I use IdeaFisher, eXpertSystem, or another brainstorming product. Can I get a discount on an upgrade to ThoughtOffice? Can students or educators get an academic discount on ThoughtOffice? I just purchased ThoughtOffice. How quickly can I get my registration number? How can I use ThoughtOffice with my Mind Mapping software? Why do I need an Internet connection to run ThoughtOffice? How can I resell ThoughtOffice software on my blog or web site? Can I create my own Topic Modules to use with ThoughtOffice? How do I install my eXpertTopic Modules? What are the minimum system requirements to run ThoughtOffice on my computer? Can I install ThoughtOffice on more than one computer? What are the terms of the license? I’ve just now installed ThoughtOffice on my Mac. Why is it not running properly? 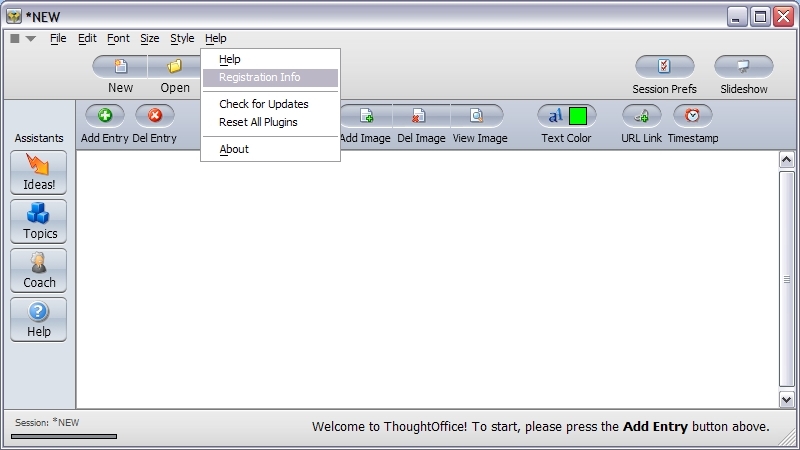 I’ve just installed ThoughtOffice, and I get an error message – “Cannot locate support file: Plugin…” What’s up? I’ve just installed ThoughtOffice. Why doesn’t the Topics Browser seem to be working? Why does the Topics Browser seem to take so long to list my modules? I get an “Internet connection cannot be found” error message in the IdeaBrowser. Why is that? 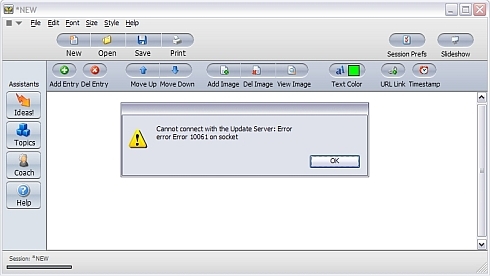 Why am I getting an “Error 10061 on socket” error message? 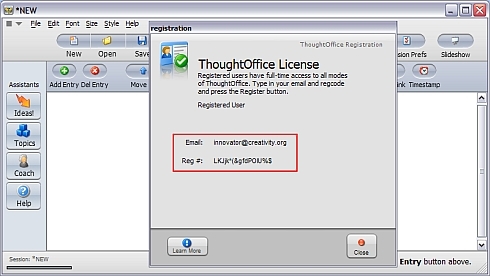 Why is the ThoughtOffice demo asking me for a registration number? I’ve installed the ThoughtOffice demo for Mac OS X. Why don’t the “Idea” and “Topics” buttons work? Where can I find my registration number? And why do I need to keep it handy? How quickly can I usually get a response to my e-mail to ThoughtOffice Support? Where can I learn more about ThoughtOffice Brainstorming Software? 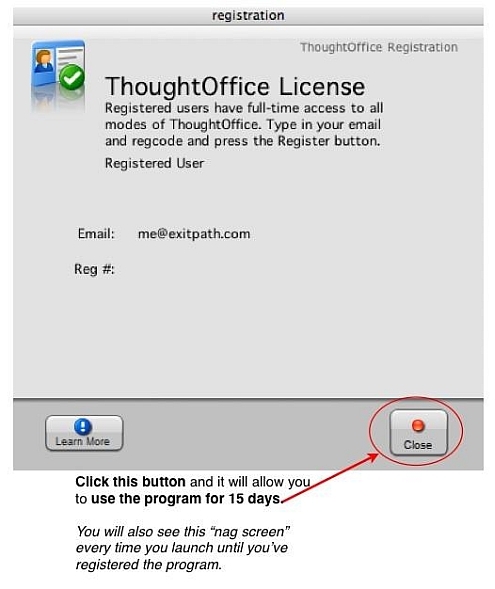 Is ThoughtOffice completely compatible with Mac OS X Lion? How about Windows Vista, or Windows 7? I’m thinking of upgrading my computer but I want to be sure that ThoughtOffice will still work properly. Yes, absolutely. Our development team creates the program code as Universal Binary for the latest OS X version. We’re compatible with OS X 10.7.1 in our most recent build (which automatically updates on your Mac when you launch ThoughtOffice). The same is true for Windows. ThoughtOffice is perfectly compatible with Windows 2000, XP, Vista, and Windows 7. Not seeing your question answered in the FAQ? Please contact us any time with your questions. We’re always delighted to help! What are the terms of the ThoughtOffice license agreement? Can I install ThoughtOffice on more than one computer, like both my work computer and my laptop? Yes, you are absolutely allowed (and encouraged) to use ThoughtOffice on up to three machines, per our license agreement. Very often, users install ThoughtOffice on their home PC, their laptop, and their work computer. That’s what we expected, and that’s why we wrote the license that way! We know that creativity doesn’t keep traditional business hours, and it’s important to have access to your tools at all times. I am using a Mac and successfully downloaded ThoughtOffice, but I’m having trouble getting it to run. What’s going on? ThoughtOffice MUST be installed in the Applications folder of your Mac’s hard drive in order to operate. If you accidentally installed the application in another folder (i.e. Documents), simply move it to the Applications folder. Create a folder (call it ThoughtOffice). created in the step above. Drop that new ThoughtOffice folder into the Applications folder. Drag the main ThoughtOffice app out to your Dock for easy launching. 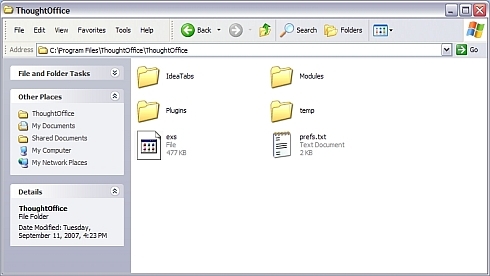 The IdeaBrowser Tabs are in a Tabs folder next to the Modules folder in the ThoughtOffice folder. Without the Tabs folder in the right hierarchy, the program won’t work properly. 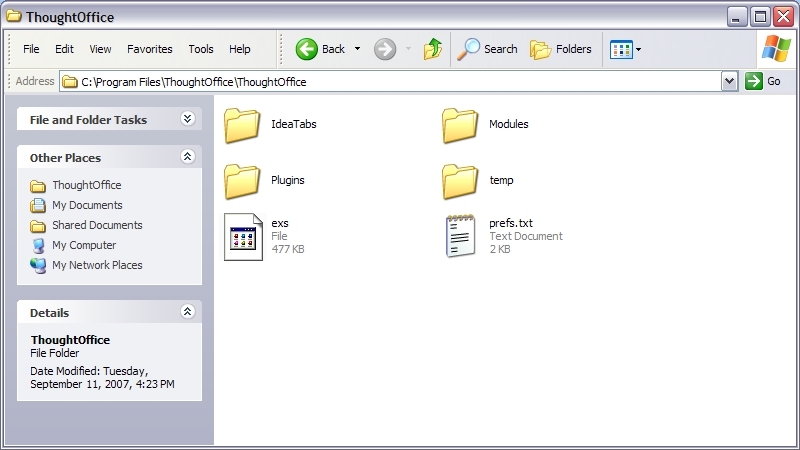 You can find screenshots and even more details on our page Installing ThoughtOffice. So, I’ve just installed ThoughtOffice, and I’m getting an error when I run the program. It says “Cannot locate support file: PLUGIN VeerPhotos 0.9.24 VeerPhotos IdeaTabs Do you wish to download a new copy?” I’ve clicked “OK” but the alert still comes up when I restart the program. How do I fix this? First, make sure that ThoughtOffice is installed properly on your computer. Visit our How To Install ThoughtOffice page for instructions and screenshots. The most important thing – be sure the program is installed in the correct folder on your hard drive. Once you’ve verified that the program is correctly installed, make sure that the file named “AltSplash.txt” is in the ThoughtOffice folder on your hard drive. If you need to get a copy of “AltSplash.txt”, click here to download a ZIP archive of the file. Unzip the archive, place “AltSplash.txt” in the root ThoughtOffice folder, per the screenshot, and the program should now be ready to update itself automatically. So, I’ve installed ThoughtOffice, I’ve clicked the “Topics” button, and nothing happens. Is the Topics Browser working? Next, make sure that the Topics Browser is not actually opening behind the Session window. Move the session window around on the screen, to be sure the Topics Browser isn’t playing peek-a-boo with you. Are you running Windows 2K / XP / Vista? Try uninstalling the demo, rebooting, and reinstalling the demo. Be sure you download ThoughtOffice from this web page. It may also be helpful to temporarily turn off your firewall and anti-virus / anti-spyware software while installing ThoughtOffice. Then reboot your computer, to restart the firewall & A/V software. Next, click on the “Topics” pulldown at the top of the dialog box. You should see “Quickstart” as an option. Select it, and it should load, and you should see a screen similar to the image above. If you are still having issues with ThoughtOffice, feel free to contact us any time. When I launch the Topics Browser, how come it takes a few moments before the pulldown menu shows up with my list of modules? No worries! The Topics Browser is not broken, but is actually verifying the contents of each module. Once this process is complete, the pulldown menu will appear as a list containing all of the modules you have imported into ThoughtOffice. Look for the Module Name indicator at the bottom of the Topics Browser. It shows each module in your list as it is loading. How do I install my eXpertTopics Modules from the CD or from the downloaded ZIP files? Select your Module file (the file name ends in .mdl) and click OK.
Open up the Topic Module Menu in your Topics Browser and you should see the new module or modules in your list. That’s all there is to it! If you want more details, check out the Importing Topic Modules page. It includes some screen shots of the process, for your reference. When using the IdeaBrowser, sometimes I get a message that says the program cannot detect an Internet connection when there clearly is one. Why is this? When the server update is complete, the search tab feature for that database will again function normally, and you will not see these error messages. I am getting an error message that says “Error 10061 on socket”, or “Cannot Connect with the Update Server”, and ThoughtOffice won’t work. But I have an Internet connection – what’s up? Fortunately, these updates are infrequent, and usually done during the weekends or off hours. ThoughtOffice will work in a limited, offline mode until the servers are back on line. I use an old version of IdeaFisher, eXpertSystem, or another brainstorming product like MindJet. Can I get a discount on an upgrade to ThoughtOffice? Absolutely! We would be delighted to offer you a significant discount on ThoughtOffice, for both Mac OS-X and Windows. As a user of earlier products such as IdeaFisher, we’re sure you’ll be very pleased with ThoughtOffice, which has been referred to as “IdeaFisher on steroids“. Simply contact ThoughtOffice Support, and we’ll respond immediately with an “e-coupon” you can use at our online store. Just let us know which product you are currently using, when you bought it, and any other information you think may help. I want to use ThoughtOffice in an academic setting, at a school or university. Can I get an academic discount on ThoughtOffice? Of course! We are strongly committed to supporting ThoughtOffice in schools and colleges. We feel that teaching people how to create new ideas, to innovate and brainstorm new ways of solving today’s challenges, is of the highest importance in today’s world. Just contact ThoughtOffice Support, and we’ll get back to you immediately with an “e-coupon” you can use at our online store, or to make any necessary arrangements. Where can I learn more about ThoughtOffice Brainstorming Software? Do you have a printed manual I can read? Sorry to say, we don’t have a printed manual for ThoughtOffice. Our web site – ThoughtRod.com – hosts most of the information that exists about the product. There are some especially good places to start, such as our ThoughtOffice User’s Guide, in PDF format. You can also review our ThoughtOffice Online Help, and our ThoughtOffice Blog and Support Pages are also excellent resources. For even more information about the ThoughtOffice software, please take a few minutes to view the short video clips on this page. They will give you a quick overview of how ThoughtOffice jump-starts your creative process. We have more videos on the way – they’ll keep coming until we run out of ideas. And since we’re using ThoughtOffice to create new ideas, well… let’s just say we’ll be making new videos for a long time. 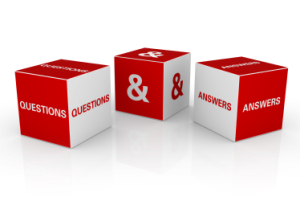 If the resources listed above are still not answering your questions, by all means, contact us immediately. We are here to help, and no question or problem is too small. How can I resell ThoughtOffice software on my blog or web site, and earn a commission for each sale? ThoughtOffice has a strong affiliate program already in place, and you can easily add your web site to our growing network of resellers. We can set you up with an affiliate link which you can place on your web site or blog, and that link will direct traffic to our online store, earning you a commission on each sale your site generates. We can provide banners and images for you to use on your site, and will even create a custom banner for you, if desired. If you are ready to begin reselling ThoughtOffice software as an affiliate, contact us now to request an affiliate sign-up package. We look forward to working with you, whether you are just starting to blog, or have a web site visted by thousands of people daily. How do people typically use ThoughtOffice with Mind Mapping software? What’s the relationship between brainstorming and mind mapping? We like to think of ThoughtOffice as the intelligence within Mind Maps – generating the “food” or “idea particles” for those Mind Maps. Currently, ThoughtOffice is used by creative professionals to generate ideas for use in their Mind Maps, which they then must copy & paste into their Mind Map application of choice. We plan to announce two new products soon, targeted at Mind Map users. The first new product will interface directly with ThoughtOffice, and will create Mind Maps, printed reports, timelines / Gantt charts, and more. The second is an API that will allow a direct connection between ThoughtOffice and MindManager, a popular mind mapping tool. We’ll have more public information available as the release date approaches. How can I create specialized or personalized Topic Modules for use with ThoughtOffice? If you want to include images in your custom Topic Module, gather your images together, resize them to no more than 300 x 200 pixels, and ZIP them into a ZIP archive containing all the images for your project. You can then either put text tags in your Word document to tell us which image goes with which question, or you can give the images names such as “image for question 1.jpeg” or “img_q1a.jpg”. This will help us to associate the images with the questions. If you decide to release the resulting eXpertTopic Module for sale, we can market the module, and arrange an agreement with you for a percentage of the proceeds. Again, please contact us if you require more information. We plan to release an eXpertTopic development tool later this year, but it is currently in “beta” status, and available only for use by our development team. As soon as it’s ready for “prime time”, we’ll announce it on our web site. What are the minimum system requirements (RAM, hard drive space, etc.) to run ThoughtOffice on my Mac or PC? If you have any concerns about the specs, please feel free to contact us to verify that your system will run ThoughtOffice. Please describe your computer’s configuration in as much detail as possible. That will help us to confirm that it has the “oomph” to do the job! Do I really need an Internet connection to run ThoughtOffice? I used to use IdeaFisher, and it didn’t need to connect to the Net. An Internet connection is essential to get the most out of ThoughtOffice. We “plug in” to online databases and resources that are just huge, and are also being constantly updated. There’s no way you could keep all that data on your laptop! 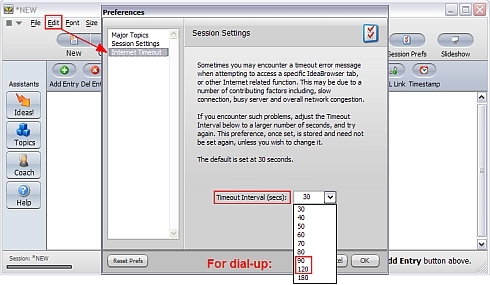 A broadband (cable, WiFi, DSL) Internet connection is preferred; you can get along with dial-up access, but it makes IdeaBrowser searches in ThoughtOffice run kind of slowly. 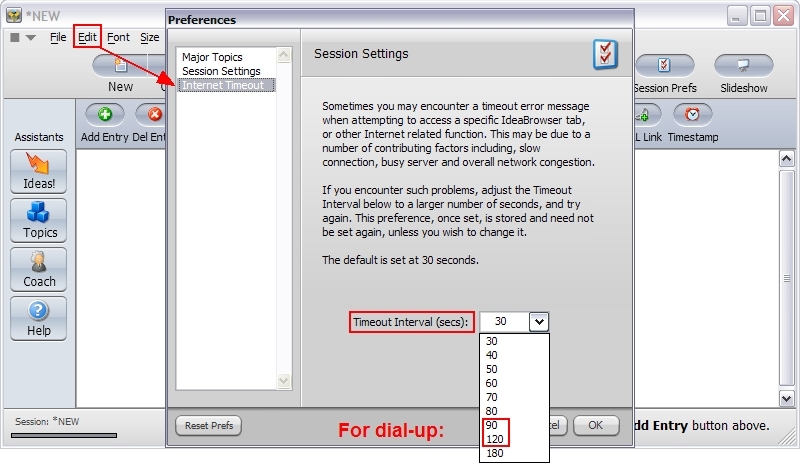 If you’re stuck someplace in Podunk or outer Mongolia using dial-up, start ThoughtOffice, click on Edit >> Preferences >> Internet Timeout, and change the Timeout Interval from 30 seconds to 90 or 120 seconds, to allow for the slower data rate of dial-up. I’ve sent an e-mail to ThoughtOffice Support, but why have I not received an immediate reply? I’ve downloaded and installed the demo, but why is it asking me for a registration number? 1. Have you ever downloaded the demo before? It’s okay if you have, but it may be that an older demo was – or still is – in your system and has expired, triggering the registration window. Try uninstalling the demo version. 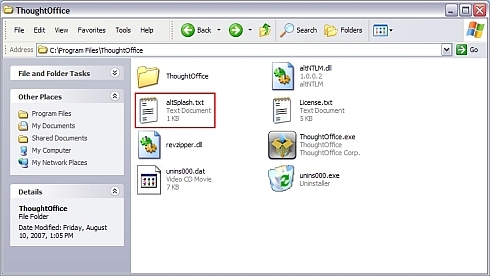 Reboot your computer, and reinstall ThoughtOffice to the default folder. 3. Make sure that a file called “AltSplash.txt” is in the ThoughtOffice folder on your hard drive. We hope that you will find these suggestions helpful, but if you find that you are still experiencing problems after following the above suggestions, then please contact us immediately. I just downloaded the ThoughtOffice demo for Mac OS X but when I click on the “Ideas” button or the “Topics” button I get a message that says, “Your Trial Period is up. Please Register.” The “Registration Info” link under the Help menu shows that I have 30 days left of my trial period. What should I do? There are some special considerations when installing ThoughtOffice on the Mac. The installer unpacks the program to the Desktop, but to work correctly, the ThoughtOffice program folder needs to be moved to the Mac Applications folder. Check out this link for instructions on Installing ThoughtOffice on Mac OS X. It may even be necessary to uninstall and reinstall ThoughtOffice, making sure that the folders are set up per the instructions. Another possible explanation is that you may have an earlier version of eXpertSystem or the ThoughtOffice demo installed on your Mac. Check for any earlier versions, and remove them to prevent interactions with the demo. If this doesn’t resolve the issue, then please contact us immediately, and we will move to the next step in the troubleshooting process. I’ve purchased ThoughtOffice and have it downloaded. It’s working great, but when will I receive my registration number? Registration numbers will typically be e-mailed to you within an hour or two of your purchase. (Sometimes, this can be delayed, but it will always be within 24 hours.) To ensure that you receive this important e-mail, please add the following e-mail address to your safelist, or check your trash / spam box to rescue the message. Please add fulfillment@thoughtoffice.com to your address book or safelist. Where can I find my registration information? I need to reinstall ThoughtOffice, and I don’t have the e-mail I was sent when I purchased the program. You can find your registration information by opening ThoughtOffice, and clicking on Help >> Registration Info. Be sure you keep your user e-mail and registration key in a safe place. If your computer gets a virus, and you have to reinstall Windows, or if your PC develops Sudden Hard Drive Death Syndrome, you’ll need both to reinstall ThoughtOffice. If you ordered the CD when your purchased ThoughtOffice, your registration key will be located on the back of the CD case. And of course, if you get stuck, please feel free to contact ThoughtOffice Support to recover your registration info for you. This article is translated into the Serbo-Croatian language by Vera Djuraskovic from Webhostinggeeks.com.